In February 1998, twenty-five years after Angela strapped on her first goalie pads, womens' ice hockey was introduced as an Olympic sport in Nagano, Japan. The U.S. women won the sport's first-ever Gold Medal, with goalkeeper Sarah Tueting wearing a little golden "angel" pin on her shoulder. Sarah never heard of Angela, but Angela was there. Funds from Angela's estate were used to augment the Angela Y. Coniglio Memorial Scholarship at Amherst Central High School, to enable that award to be increased, and to be given yearly, forever. Some of her estate will be used to establish the Angela's Cousins Fund, to honor Angela's dedication to education, and to help all her cousins (descendants of Gaetano Coniglio and Rosa Alessi Coniglio) and all their descendants in the future, as they begin their college careers. Aunt Connie Miller's grandson (Shelley's son) Nick Steht was the first recipient of an award of $250, in 1997 and Aunt Mary Sowa's grandson (Denise's son) Phil Tiranno received the award in 1998. 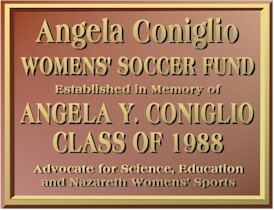 The remainder of Angela's estate was presented to Nazareth College by our family, to establish a fund to support the womens' soccer program at her alma mater. A permanent endowment will produce funds every year for uniforms, equipment and other needs for the team she played on and loved. Nazareth College held a reception to dedicate this fund on Homecoming Weekend in September 1998, the tenth anniversary of Angela's graduating class. The college has commemorated the fund with a plaque, mounted in the athletics wing of the Shults Center, on campus. "You always had a way of keeping us interested in what you were teaching. For example, the day you were teaching about peristalsis. No one really had any interest in that topic. That was until you demonstrated it by standing on your head and eating a gummy worm. .... No other teacher was that enthused or cool enough to do that." One of the best players to appear in a Nazareth College soccer uniform, Angela Coniglio was instrumental in the Golden Flyers' string of success in the 1980s. Blessed with excellent skills and outstanding speed, Coniglio holds Nazareth records for most assists in a career (31) and in a single season (14) as she played a significant part in four straight winning seasons and a 50-22-5 record from 1984 through 1987. Coniglio successfully teamed with Hall of Famer Lynne Stever to provide a formidable 1-2 scoring punch. And in the one season (1985) in which Stever was injured, Coniglio stepped up to lead the team in scoring with 18 goals and six assists. Coniglio completed her career with 115 points, including 42 goals, and is one of only two players to amass more than 100 career points, and was the only player to twice record three assists in one game. Coniglio also played three seasons of softball at Nazareth, helping the Golden Flyers to a 28-7-1 record.